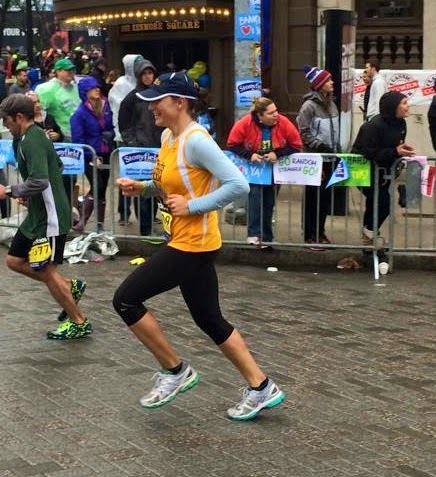 I ran the Boston Marathon!!! Saying hey to Coach at Mile 9! Anywho, before things got real between Hopkinton and Copley, I had a great weekend with Sister2! She came from San Francisco to hang out, relax, carbo-load, and cheer me on. Food-wise go ahead and be jealous -- we had Indian, Ethiopian, brunch, cake, and cannolis yummm. 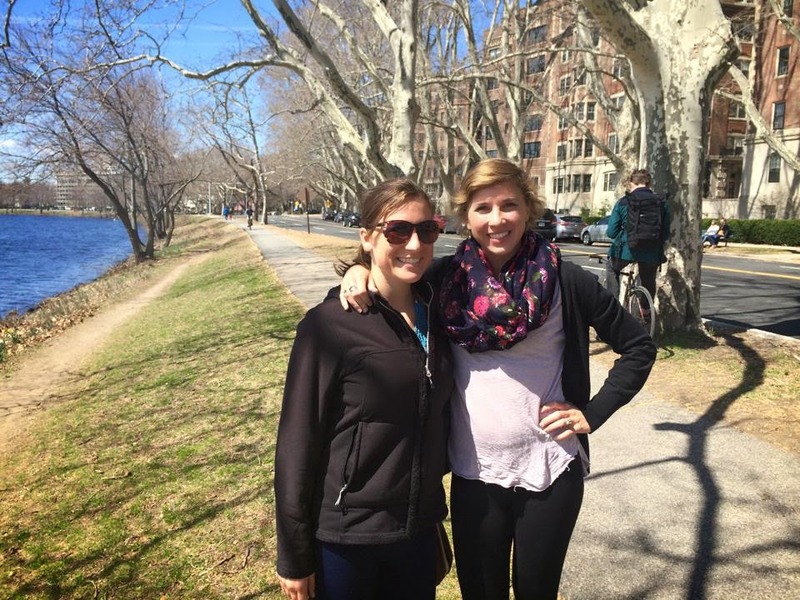 We meandered around Cambridge and Boston and went to the Marathon Expo to see what was to be seen (and get some free snacks). Volunteer: Do you want a pen to sign the wall? 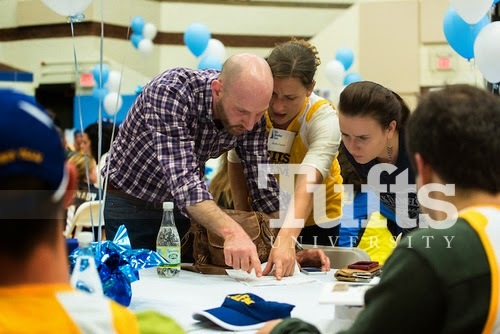 I was running for the Tufts Marathon Team, so we all celebrated with a dinner the night before the race. 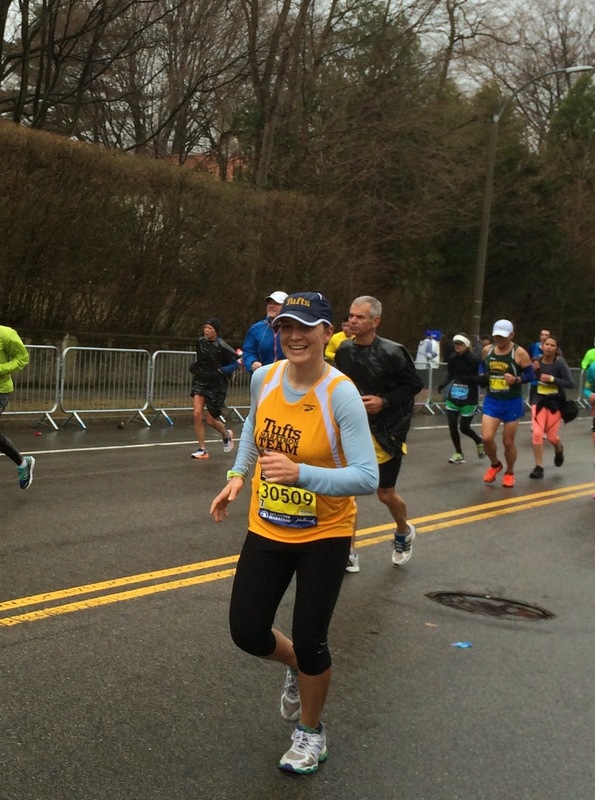 We'd been training together since September, and for most of people this was their first marathon experience. The team was 100 runners total, 13 of which were Fletcher students. Look at all of us, so happy and unsuspecting... .
At the dinner we strategized the spectating (I take this seriously), mapping out who would be where and when. Now on to race morning! As I got into more open road I hit a rhythm and felt better, running something more like 7:20-7:40 miles. The crowds in the first few towns were awesome! It really is a 26.2 mile block party for the people of Massachusetts. At Mile 9 saw the Tufts contingent and they went crazy! A whole bus-load of other people's parents cheering for me? I'll take it! Coach jumped into the course to say great job (see the first picture in this post) and I was on my way. Ok so up to this point it's all sounding pretty good. But shortly after the Tufts group things started to get shaky. All of a sudden in Natick Mile 11 felt like Mile 20...but it was only Mile 11. I told myself no big deal -- in marathons pain is not linear and you can feel bad then feel good later on (which is true!). Three of my classmates surprised me in Wellesley (Mile 13), and I was SO HAPPY to see some familiar faces. I had no idea how much a difference it would make to have people I know cheering for me along the way. That gave me a boost that lasted a couple miles. From Wellesley to Newton, however, was a deep dark journey of misery that I hope to never repeat. Everything hurt SO MUCH. Usually I'm good on downhills but everything from my knees down was in excruciating pain. I just kept thinking that it was too cold to walk, and that I couldn't drop out because people came out to see me. I knew a big group of friends was waiting at the top of Heartbreak Hill, so I willed myself to make it there, telling myself that I could run as slow as I wanted but I had to finish. OH and here's a random occurrence/question: at the base of Heartbreak Hill next to the intersection of Lowell Street and Commonwealth Avenue I saw a person holding a cardboard sign that said EatRunRead!?! And at first I thought it was a random coincidence, but the sign also had a picture of my running cupcake logo! I was too delirious to fully register and stop to investigate at the time -- but who was this person? If you're reading this leave a comment because the mystery is killing me! As expected, the massive group of Fletcher cheerleaders at the top of Heartbreak Hill gave me a major boost, followed by these heroes at Mile 22. I was so encouraged by the people cheering me on, there is no way I would have kept going without them! Those last few miles? Well, they happened. I was yet again pulled along and then pushed ahead by my main cheering contingent -- my sister, boyfriend, and best friend all at Kenmore Square just 1.5 miles from the finish! So I made it. I crossed the finish line, was given a medal and some water and a completely useless wrap thing (I believe they are supposed to be solar-ish to keep you warm, which requires sunshine), and after some very slow wandering through the cold found my people! I'm definitely glad it's over, though I think it's a little too soon to say I'm glad I did it. But I DO want to say THANK YOU to everyone who donated to my fundraiser, and supported me along the course, and who have put up with my whining since then (so many stairs in my life...the struggles are so real). And also a big congrats to everyone who ran on Monday! 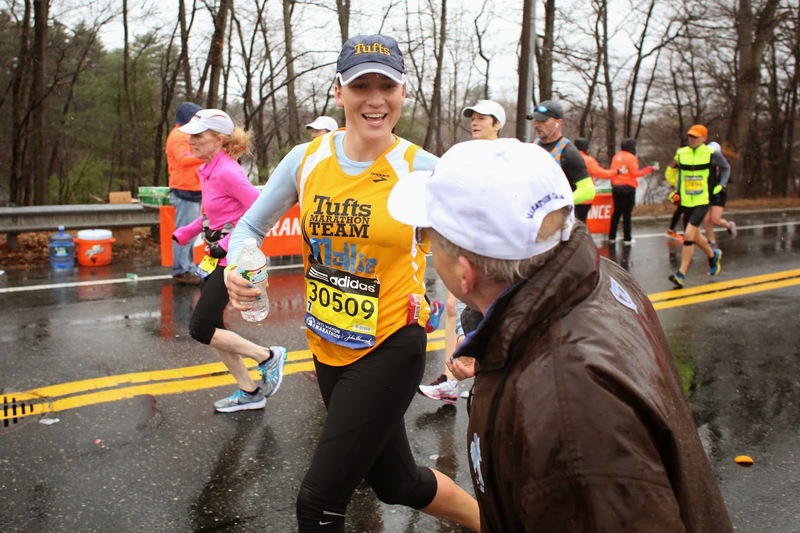 As I neared the finish line a woman kept shouting "We're finishing the Boston Marathon! We're finishing the Boston Marathon! We're finishing the Boston Marathon!" And we did. You guys. My thesis may not be finished and my post-graduation future may be completely up in the air, but I finally found the right carrot cake recipe for me, so all is right with the world! Everyone loves carrot cake. It's the cream cheese frosting, the spicy-ish flavor, and the delicious moist texture that adding veggies to desserts so often yields. But at the same time, everyone has their own carrot cake preferences. Nuts or no nuts? What about raisins? How crumbly? How chunky? Layer cake or sheet cake? I'm pretty positive I found the perfect balance in this recipe: carrots, pineapple, pecans, coconut, and the magic ingredient: apple sauce! This cake is all things a carrot cake should be, plus it's healthy(ish) -- just a quarter cup of oil in the whole cake. The frosting on the other hand...well, if the cake is healthier then that balances out the frosting, amiright? This is the perfect Easter/springtime/anytime dessert. RoommateRachel and I had seven friends over last night to celebrate East-Over: Matzo Ball Soup followed by this Carrot Cake. Deeelicious. We poured a glass of wine for Elijah, and then snacked on dark chocolate Easter eggs after dinner was over. Mash-up holidays really are the best. 1 cup Dole crushed pineapple (not drained!) -- use the pineapple in JUICE not syrup. Stir in carrots, coconut, nuts, vanilla/whiskey and pineapple. Pour into two greased and floured 9-inch round cake pans. Bake for 35-40 minutes until the cake just starts to pull away from the sides and the middle doesn't look gooey. Let cakes cool in pans for 10 minutes, then run a spatula or knife around the edges and turn out onto a wire rack to finish cooling. The cakes must cool completely before frosting! Beat the butter and cream cheese thoroughly. Add in the vanilla and 2 cups powdered sugar and beat until and smooth. Add milk one splash (about a tablespoon at a time), along with the rest of the powdered sugar until it reaches a spreadable consistency. Frost first layer (with a generous layer of frosting in the middle). Put second cake on top and frost first the sides and then the top of the cake. Decorate with coconut and chopped nuts and chocolate Easter eggs if desired.